Need a quick scarf to give as a gift or add to your outfit? 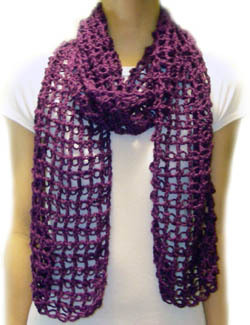 This scarf is very easy and simple to crochet, yet still appears to be dainty, lacy and elegant. Size can be adjusted by using the instructions within the pattern. You can even make it big enough to be a shawl! By purchasing this pattern, you will be support Crochet Spot. Your support is truly appreciated! Please visit the Crochet Spot Store to download. If you need help with crocheting your scarf, just let me know and I’ll be sure to help! This entry was posted on Friday, December 11th, 2009 at 12:00 AM by Rachel Choi	and is filed under Best Crochet Patterns. You can follow any responses to this entry through the RSS 2.0 feed. You can leave a response, or trackback from your own site. I am interested in buying this pattern… but not interested in a $10 a month membership… I do not crochet enough for that to be any benefit to me… is it for sale somewhere else? You will need to create an account to shop in the store (creating this account is free). The account will save your purchased patterns so that you can log in and download them whenever you want. Let me know if you have other questions or need more help shopping in the store. I am interested in buying this pattern… but I cannot find it on the site….